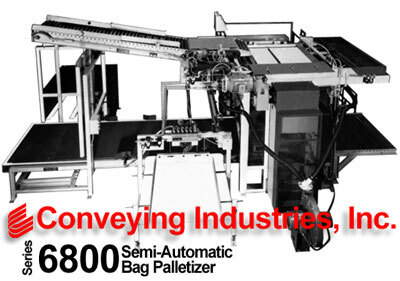 All functions of the Model 6800 Semi-Automatic Palletizer are automatic, except for sliding the bags in the desired patterns and the opening and closing of the air flotation split loading plate. The operator sets the electrical controls to any quantity of bags per layer and any number of layers per pallet. Bags are automatically accumulated, counted and metered, permitting one man to palletize 15 to 22 bags per minute or more. The rate varies, depending on the pattern and the operator. Each bag slides easily into position on the air flotation split loading plate. When the plates retract, the layer is transferred to the pallet and the incoming bags are automatically accumulated. When the plates close, the accumulated bags are automatically metered to the operator. Filled pallets are automatically conveyed to the filled pallet accumulator conveyor. An empty pallet is simultaneously conveyed to the filling position. During this sequence, the operator continues to position bags on the air flotation split loading plate. The versatile Model 6800 Semi-Automatic Palletizer is specifically designed to handle a variety of bag sizes, bag rates, bag patterns and pallet types and sizes. The simple design and 13,000 lb. heavy duty tubing and channel construction reduces vibration to ensure years of high productivity. The air flotation split loading plate provides an air foil for easy bag positioning. The split loading plate transfers the center of the bag layer to the pallet first to ensure a uniform pallet load. Layer squaring plates at the loading area ensure that a tight bag layer is transferred to the pallet. Air cylinders and electric motors provide the power required for the Palletizer. Hydraulics are not used to ensure a clean operation and lower maintenance cost. The Pallet Dispenser is an integral part of the Palletizer and is operated by an air cylinder and motor to eliminate high maintenance items, such as gears and special linkages. Each Semi-Automatic Palletizer is custom designed to meet specific requirements.